Whether you already maintain a healthy lifestyle or want to learn more about enhancing your well-being, this week-long event is a great way to dive deeper into the benefits of self-care. With over 30 classes, workshops and speakers, you’ll explore health and wellness in a fun, accessible way. Explore classes in yoga, barre, pilates, meal preparation, acupuncture and massage and more. The event will be held at various locations around Bozeman with the Rialto Theater as home base. The week culminates with a fun run, the Edge 5K Walk or Run! Fall wouldn’t be complete without a hay maze and the Bozeman Straw Bale Maze is a local tradition. Each year, a new maze forms the shape of something new, and trust us, they are challenging for all ages! This year’s form has yet to be announced so watch their Facebook page! Other activities include hayrides, concessions and a power jump for kiddos. Just because summer has passed, doesn’t mean the Farmers’ Markets are ending; especially when the fall bounty is at its peak! The Emerson Cultural Center hosts a Winter Farmers’ Market from fall through spring. This time of year, the market is exploding with greens, veggies, apples, eggs, grains, meats, canned goods, fermented foods, and fresh baked goods. Each year, the largest known golden eagle migration in the United States takes place in the Bridger Mountain Range. Since 1991, a formal raptor migration count happens at Bridger Bowl ski area in the Custer Gallatin National Forest is. Along with the actual count, a fun and interesting weekend event commences in Bozeman and Bridger Bowl. 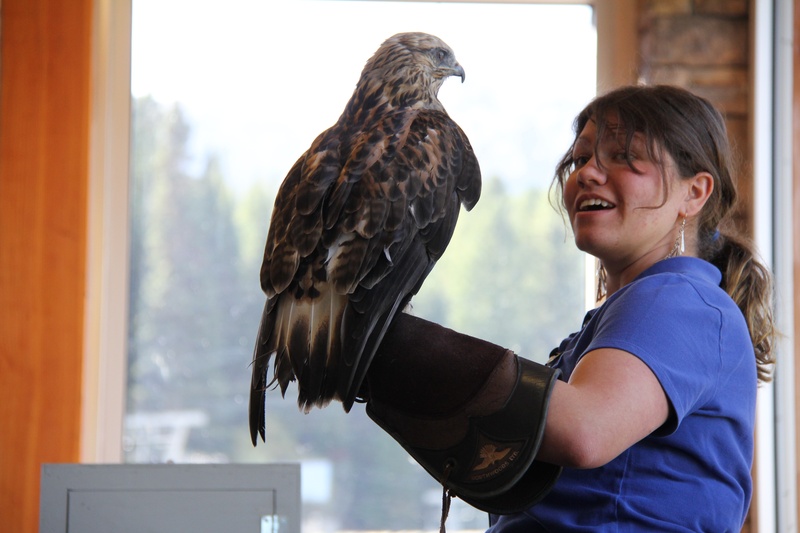 Enjoy educational talks, live raptor viewing and entertaining activities the whole family will enjoy! MSU Bobcat fans come out in full blue and gold for the annual homecoming parade and football game. Events take place throughout the week culminating with the pep rally on Friday evening. College students, alumni and local fans gather in downtown Bozeman to get in the spirit. The homecoming parade starts at 10:00 am on Saturday morning followed by the game at 2:00 pm. This year’s matchup is with the Idaho Vandals. Go Cats! It’s no secret, this haunted house will scare even the most fearless of adults. Students, faculty and parents at this little school just outside of town put on a show that has caused more than one person to leave before finishing. For those who love a good Halloween scare, this is the place for you! For more Bozeman activities, go to www.bozemancvb.com.